We’re already fans of Itzy Ritzy and their handy reusable products, such as reusable Wet Happened bags and soft Bamboo Nursing Pads. Now there’s even more to love about this cool eco-minded company. Itzy Ritzy recently partnered with Yum! Brands for their World Hunger Relief Campaign, so now you can quit using icky plastic baggies and help feed hungry children all at the same time. Each purchase of one set of limited edition World Hunger Relief Snack Happened Snack Bags (two bags per set) helps feed 40 children in a school feeding program. That’s a big impact. You keep plastic out of the landfill plus support children in need. 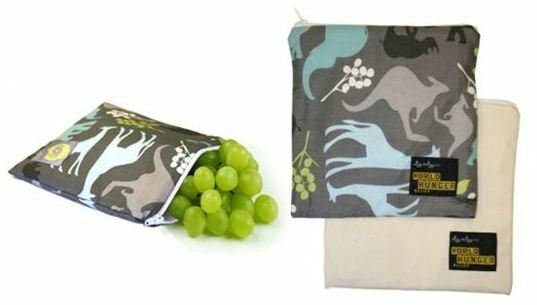 Each set of limited edition World Hunger Relief Snack Happened Snack Bags includes two individual snack bags made with a 100% cotton designer fabric exterior plus a thick and lush PVC-free waterproof interior lining. Bags are food-safe, FDA approved and BPA-free. Bags are also fitted with lead-free YKK zipper tops, which means quiet snacking (no Velcro like most reusable snack bags) and bags are sized perfectly for little hands. You can use these bags for snacks on the go, inside waste-free lunch kits, as tiny first-aid kits, or to hold crayons, iPods, cameras and so much more! Best of all bags are machine washable. These limited edition bags are available in three different design styles. 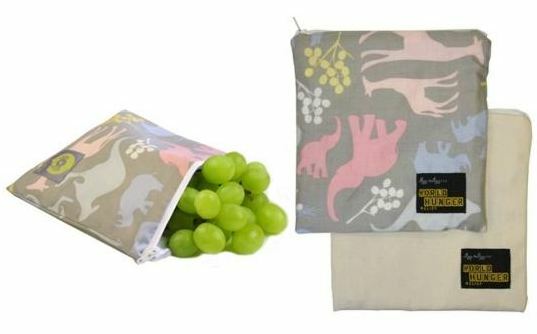 We're already fans of Itzy Ritzy and their handy reusable products, such as reusable Wet Happened bags and soft Bamboo Nursing Pads. Now there's even more to love about this cool eco-minded company. Itzy Ritzy recently partnered with Yum! Brands for their World Hunger Relief Campaign, so now you can quit using icky plastic baggies and help feed hungry children all at the same time. Each purchase of one set of limited edition World Hunger Relief Snack Happened Snack Bags (two bags per set) helps feed 40 children in a school feeding program. That's a big impact. You keep plastic out of the landfill plus support children in need.